A high school in Sante Fe, Texas was the scene of a mass murder recently, with at least 10 people killed and as many more wounded. A 17-year-old student, who was able to take a shotgun, a pistol, and some “pipe bombs” onto the school grounds, has been identified as the assailant. Unfortunately, incidents like that at Sante Fe High School make headlines on a regular basis. Schools have been the most recent targets, but churches, workplaces, and other “Gun Free” zones are equally at risk. Given the “success” that the unhinged have had, it is amazing that most still consider mass shootings to be something that happens elsewhere. The sad truth is that there’s no reason to believe your home town is immune to such events. This became painfully clear as a shooter killed 17 at a high school just a few miles from our home in February, 2018. 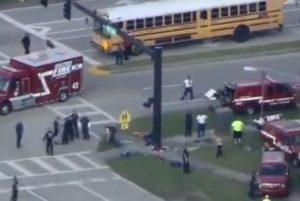 This is perhaps the saddest statement of the New Normal: The average teenager is no longer surprised that a mass casualty event might occur at her school. It’s time to replace complacency and fear with action to keep our schools safe. A number of steps can be taken that might help in this mission. Improving security is clearly a priority, but how exactly can this be accomplished? Placing trained security at school entrances is of paramount importance. Many schools have taken steps in this direction, but more are needed both in numbers and visibility. If it is obvious that trained, armed security is a feature of every school entrance, some gunmen may abort their missions. Entrances should funnel visitors through areas with trained security and, perhaps, scanners that can identify weapons. Entry points should be limited in number, and most should be locked down except for emergency exits. School perimeters should be fenced and monitored. Of course, some will ask how schools can afford multiple professional security officers. The question should be: How can our society afford to have our children mowed down in these attacks? The price for school safety isn’t cheap, but it’s too important to pinch pennies. Some areas might be able to supplement their paid personnel with trained volunteers. There are likely a number of people in each community who are committed to school safety and willing to donate some time to keep students safe. These people can be assembled into teams and trained to identify threats, notify authorities, and provide first aid when needed. 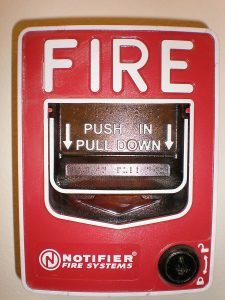 An issue that should be addressed immediately is the protocol related to fire alarms. Shooters have learned to pull alarms in order to get targets out of classrooms into corridors, where they are easier targets. This tactic was used by the gunman in the South Florida high school incident. At Sante Fe, a teacher set off the alarm in an effort to warn of the attack, but with the same end result: multitudes of unsuspecting targets densely packed in the halls. Fire alarms are necessary, of course, and an orderly process is needed to move large numbers of students out of buildings. The same process isn’t the best strategy for terror events, however. A clearly different alarm, possibly a siren or foghorn, should warn of this type of incident; trained staff should then respond by entering and quickly exploring hallways while awaiting police response. Instilling a culture of situational awareness would be a way to decrease future attacks and casualties. Situational awareness is a state of calm, relaxed observation that maximizes the ability to spot threats. These threats are known as “anomalies”; learning to recognize them can identify suspicious individuals and save lives. Situational awareness also involves always having a plan of action when a threat occurs, even if it’s as simple as making a note of the nearest exit at the mall. This may seem like plain old common sense, but in this era of smartphones, so many of our youngsters are oblivious of their surroundings. Before, the worst that could happen was a bump on the head for walking into a streetlamp. Today, the consequences may be much worse. Teach our citizens to avoid the natural paralysis that occurs in unexpected circumstances. The gunman at Sante Fe caused twenty casualties; a shooting at a Orlando nightclub caused 200. it’s possible that quick action while a gun was being reloaded might have made a difference in the outcome. Having said that, it’s hard to act when your brain isn’t trained to do so. When such training occurs at a young age, however, it becomes second nature and might save lives. A strategy such as the Department of Homeland Security’s “Run, Hide, Fight” triad are simple enough and could be part of the answer. Given the importance of saving lives, why not train our students in simple first aid techniques to stop bleeding? Rapid action by bystanders is well-known to decrease the number of deaths from hemorrhage. Add “Reducing” bleeding to “Reading, ‘Riting, and ‘Rithmetic” as part of school curriculum, and lives might be saved. Identify persons of interest through their social media posts. Many active shooters are vocal about their intentions. You might be concerned about “big brother” monitoring our public conversations on Facebook and other sites, but you must answer this question: How many deaths might occur as a result of ignoring warning signs? Privacy and public safety must achieve a reasonable balance. We must always be on the lookout for signs of trouble. Even if this drives some potential gunmen underground, it might identify others in time to prevent an attack. 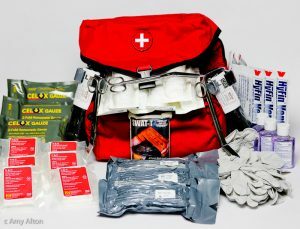 Provide first aid kits for bleeding in public venues that can be accessed by those at the scene. With supplies, the Good Samaritan will be more likely to save a life. I predict that these kits will be fixtures on the wall next to the fire extinguisher in the uncertain future. Although you might consider it overkill, putting a tourniquet in your high school student’s backpack (and teaching them how to use it) may not be a bad idea. So is the idea of buying a gun safe to limit access appropriately. training. In others, many will. Simple possession of a weapon, however, is useless without knowledge and experience in its use. Despite the above recommendations, our response as a nation has been slow to correct the problem. I say that era must end. Let’s stop being “soft” targets. We must forsake the notion that shootings are just part and parcel of the New Normal. Instead, we must begin the process by which we change our attitude and level of vigilance as a society. 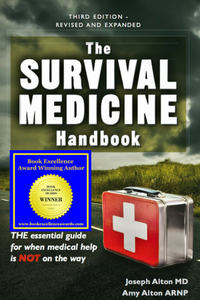 Learn more about active shooter incidents and many other disaster preparedness issues in the award-winning Third Edition of The Survival Medicine Handbook: The Essential Guide for When Medical Help is Not on the Way, available at Amazon.